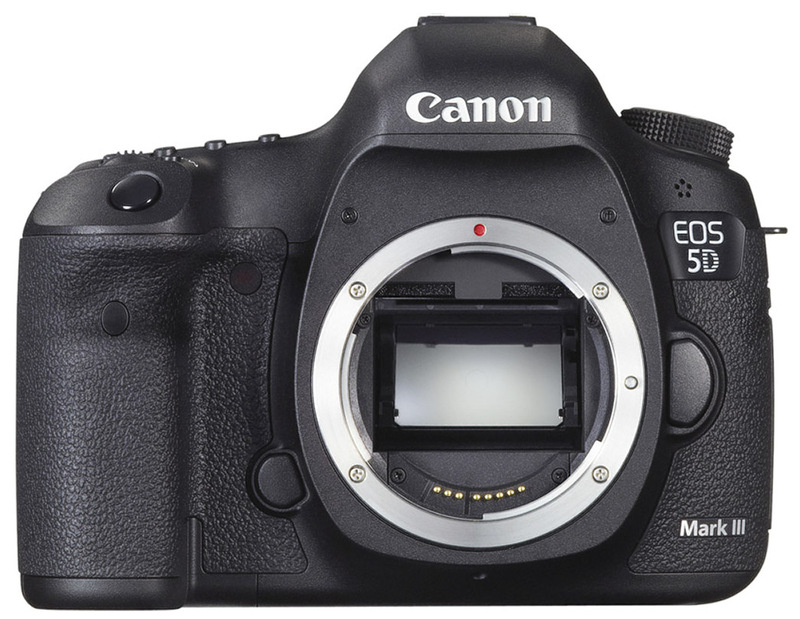 Man Behind Lens: Canon 5D Mark III Has Landed! Canon 5D Mark III Has Landed! Johnny Come Lately, the DSLR that started video film making FIVE years ago has been replaced; finally! 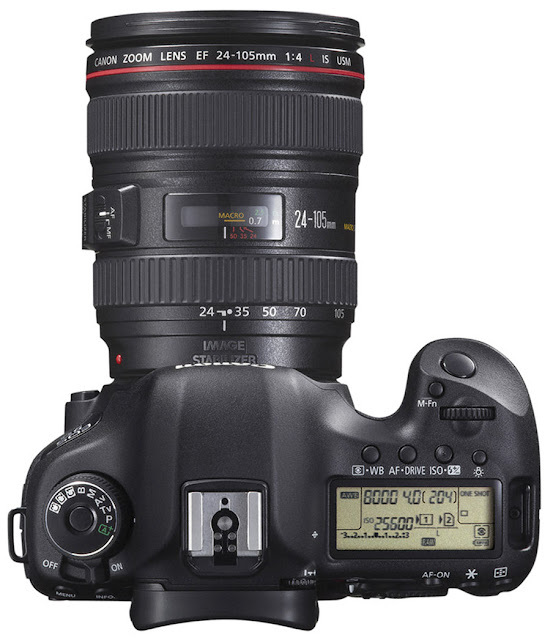 United Kingdom, Republic of Ireland, 2nd March 2012 – Canon today announces the latest addition to its world-famous EOS range with the launch of the new EOS 5D Mark III. The EOS 5D Mark III builds on the performance of the legendary EOS 5D Mark II, offering improved speed, greater resolution, enhanced processing power and extended creative options for both stills and Full HD movies – providing unparalleled artistic freedom for the most demanding photographers. The EOS 5D Mark III features a newly developed Canon full-frame 22.3 Megapixel CMOS sensor that?s designed from the ground up to create high resolution, perfectly detailed images with unprecedented speed and clarity. A full 24 x 36mm, the sensor captures 5784 x 3861 large individual 6.25 µm pixels and has a much-improved S/N ratio resulting in better images from the start. A new photodiode structure with an increased photoelectric conversion rate increases the sensor's sensitivity by approximately 2 stops over previous models, meaning higher ISOs with the lowest noise of any EOS digital camera. And a 2-line 8-channel simultaneous signal readout means speeds of up to 6.0 fps (RAW + JPEG) are possible! 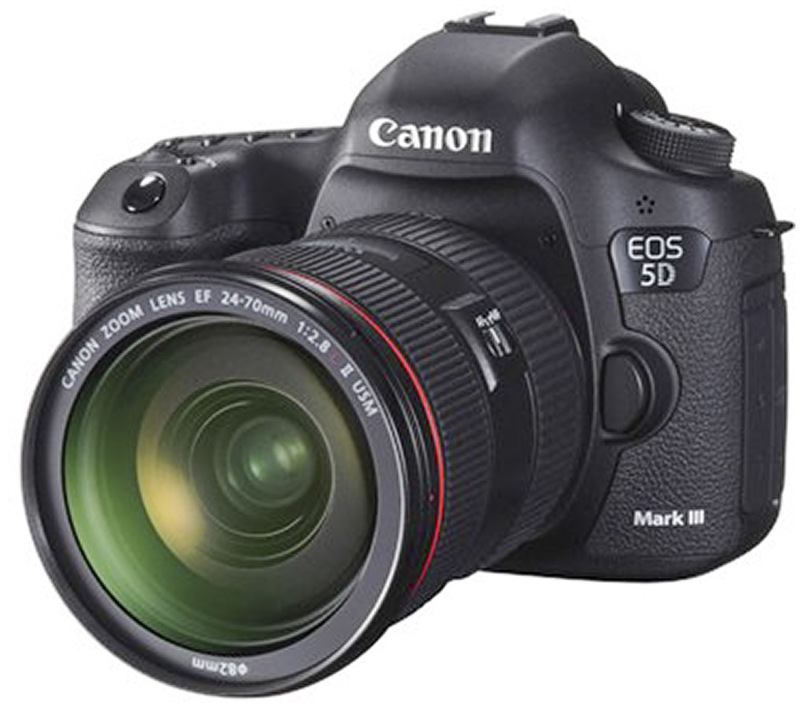 Addressing the requests of the pros and building on the unprecedented success of its namesake, the EOS 5D Mark III captures HD video with a level of sophistication on par with professional movie cameras offering phenomenal performance on a DSLR. It offers both All-I and IPB compression, supports H.264/MPEG-4 AVC High Profile, and automatically splits files greater than 4GB (FAT specifications) for extended recording without interruption. It offers the option of timecoding during recording only (Rec Run) or at all times (Free Run), useful for multi-camera shoots. It also features improved sound recording adjustment capabilities, offering 64-step volume control accessible through the Quick Control screen during video shooting, plus a dedicated headphone jack for convenience in shooting. The CMOS sensor's new drive system significantly increases image processor performance, reducing color artifacts and moiré (a common problem that occurs in scenes with horizontal lines), and ensures that the EOS 5D Mark III can record at a number of frame rates up to ISO 25600 in H mode. The EOS 5D Mark III's Intelligent Viewfinder offers a sharp, bright approximately 100% field of view with an approximate magnification of .71x, a viewing angle of 34.1° and a 21mm eye-point. With a new construction featuring aspherical lens elements, the viewfinder displays less distortions and color aberrations than previous models. It uses a transparent LCD to superimpose a customizable combination of focus points and gridlines directly over the image. The AF status indicator can even be directed to display within or outside of the viewfinders image area. With the intelligent viewfinder, unlike with other cameras, the photographer has the choice of seeing shooting information or looking only at the scene in front of the camera. The ability to effectively erase all shooting data and turn it back on with the touch of a button gives the photographer the opportunity to concentrate simply on looking and composing the photograph without distraction, a great advantage in numerous shooting situations. For an expanded range of applications, the EOS 5D Mark III is compatible with Canon peripherals for wireless file transfers and GPS. The Wireless File Transmitter WFT-E7A attaches easily to the EOS 5D Mark III, supports 802.11 a/b/g/n, has a built-in Gigabit Ethernet connection, supports FTP mode with automatic resend, EOS utility mode and WFT server mode, and can time sync multiple cameras on the same network. Canon's GPS Receiver GP-E2§ connects via USB or Hot Shoe, is dust and water resistant, records latitude, longitude and altitude, has a logging function and an electronic compass to record movement and even has a GPS† time sync function, especially helpful when a project is shot among different time zones. 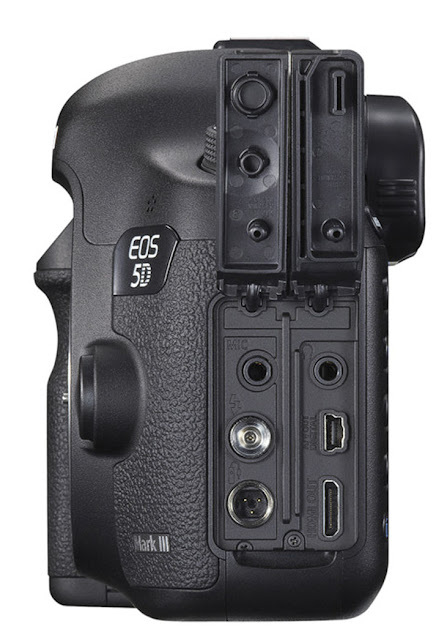 The 5D Mark III's dedicated Battery Grip BG-E11 has buttons and a multi-controller and delivers seamless performance whether the camera is oriented vertically or horizontally. It accommodates 2 LP-E6 batteries or an included AA battery magazine, and is very helpful in counter-balancing large lenses when shooting handheld. 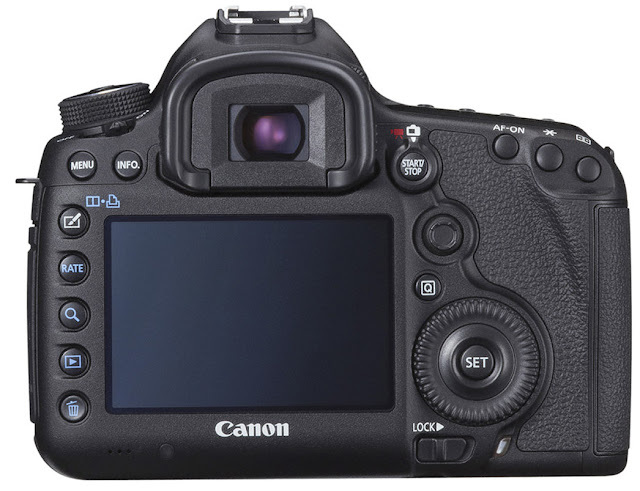 § EOS 5D Mark III requires a firmware upgrade to be compatible with the GPS GP-E2, which will be available soon. † In certain countries and regions, the use of GPS may be restricted. Therefore, be sure to use GPS in accordance with the laws and regulations of your country or region. Be particularly careful when traveling outside your home country. As a signal is received from GPS satellites, take sufficient measures when using in locations where the use of electronics is regulated. Yippee about time. When I get my lets play with it.